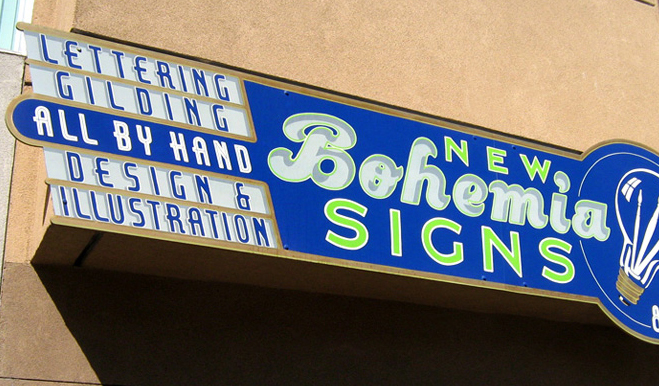 The New Bohemia Signs team has been hand-gilding, lettering, painting, and designing business signs, windows, menus, a-frames, and anything and everything that strikes their fancy since 1992—making them the longest established sign shop in San Francisco. We were so excited to join forces with New Bohemia’s Damon Styer and Aaron Cruse on our new Alter Ego Pads (inspired by traditional gilt lettering once found on the doors of private eyes, professors, and lawyers). Damon, who has been hand-lettering professionally for 16 years (and personally for over 30 years! ), started an apprenticeship at New Bohemia in June of 1999. He bought the business six months later and has been there ever since. 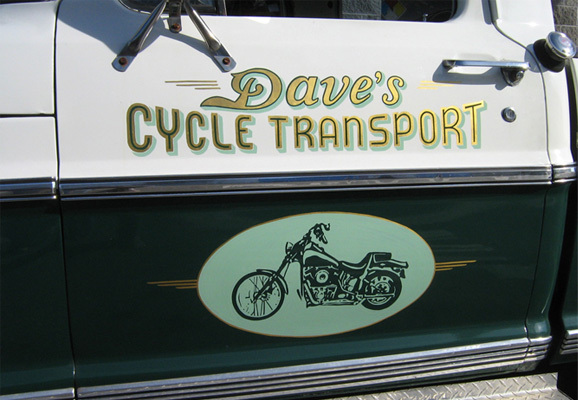 His colleague Aaron joined the sign shop in 2007 and has been hand-lettering professionally for 15 years. 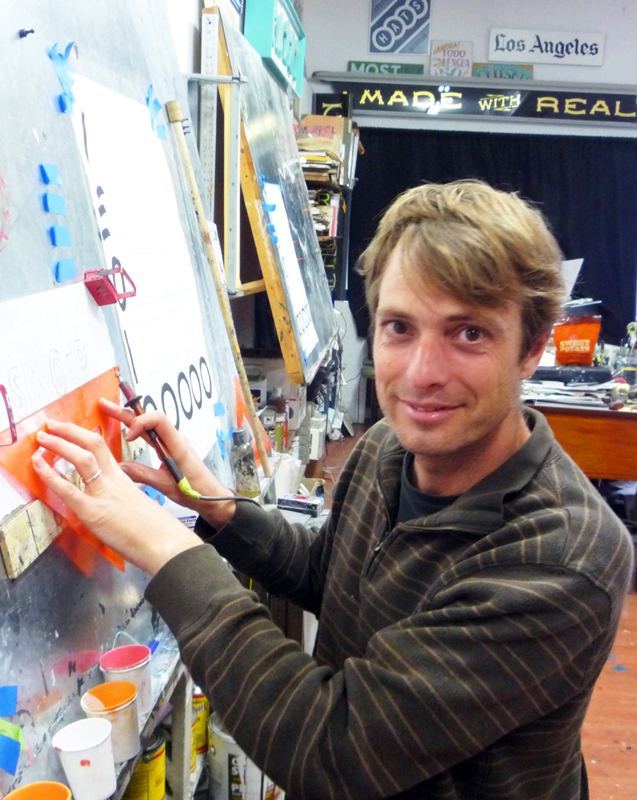 Meet Damon Styer, owner and hand-letterer at New Bohemia Signs. 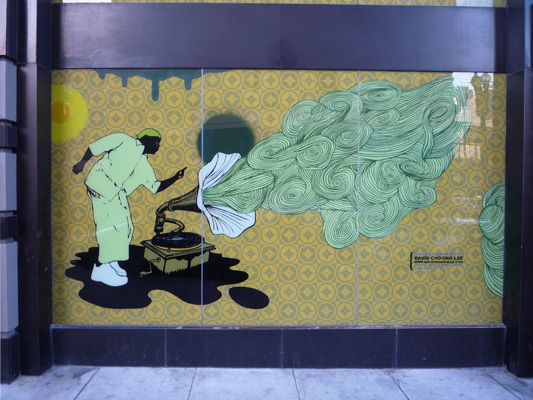 An exciting and upcoming project for the team has them heading to Guerneville, CA this April to paint and gild wall murals and signs made by designer Jessica Hische on an old bank that’s being turned into an ice cream parlor and art gallery. Much like all of their work, we look forward to seeing it. 1. How did you get your start in hand-lettering and hand-painting signs? Any advice you’d give to aspiring typographers, illustrators, and designers out there? Damon: I took a course in calligraphy when I was twelve. I remember, as a kid at church, often doodling the shadows (or, as I later learned to call them, “reveals”) off to one side of invisible letters, and it felt like I was teaching myself some sort of code. I didn’t start painting letters until I started as an apprentice at New Bohemia. I’m not especially full of advice . . . I guess I just fall back on the old adage, “Always aspire to greater speed.” I dunno if it’s true across the board, but letters very often look better painted faster. Aaron: I have always been drawn to letters and language. When I began to study design, I preferred the lettering in old-style guides, type catalogs and Letraset books, and used those as a basis to manipulate or draw my own letters. At the time, everything was going digital, and my school was getting rid of boxes and boxes of those things. Nobody else wanted them, and using computer software at the time was tiresome—so I did a lot of things by hand. It was definitely more fun than waiting for a progress bar. It evolved from there to customizing and drawing with technical pens, and eventually to a sort of hybridized hand-drawn and digital process. Meet Aaron Cruse of New Bohemia Signs. When I started as an apprentice at New Bohemia, it was pretty much the first time I’d used a brush for lettering and I’d never really painted anything other than the walls of my apartment. 2. What’s your favorite typeface (either created by you or by someone else)? Damon: Hasn’t occurred to me to pick a favorite . . . I guess I’m partial to my own casual lettering, since it gets done quickest, and I’ve never been especially enamored of precision. Lately, I find myself pulled in a couple of directions for design solutions: either mid-20th-century “googie” style (kidney-bean backsplashes, sparkly dingbats, and Romper Room/Sock Hop letters), or late-19th-century “gaslight” style (a hodge-podge of ornate and gothic letter styles laid out on overlapping arced or zagging planes over framed pattern-covered backgrounds). Aaron: It really depends on what I’m working on and researching at the moment. Right now I’m interested in the work of Dard Hunter, and Elbert Hubbard’s Roycroft Press—American Arts and Crafts anarchists! It’s hard to say that the lettering they produced is my favorite exactly, but it has my attention right now. 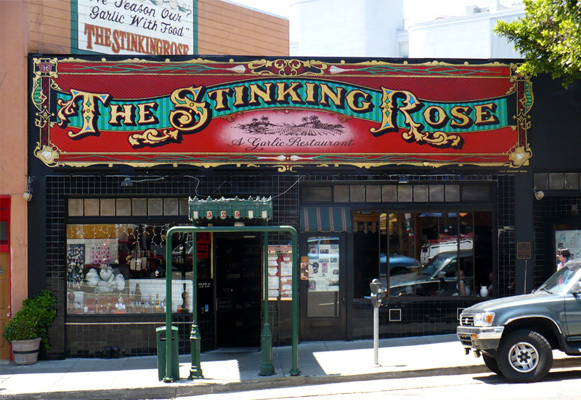 A hand-painted sign by New Bohemia for The Stinking Rose. 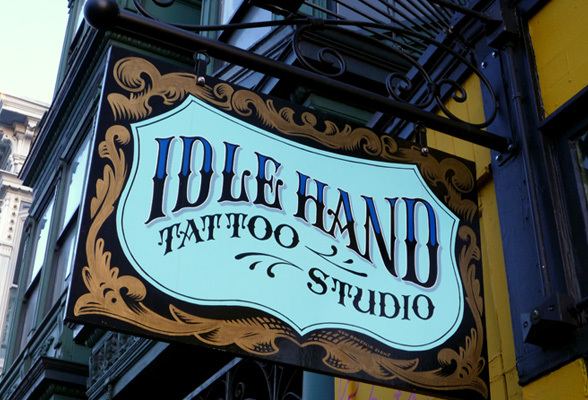 A hand-painted sign by New Bohemia for Idle Hand Tattoo Studio. 3. Favorite hobbies outside of designing and sign painting? Damon: Web surfing? Reading, camping, biking, kayaking . . . kazoo . . . coffee roasting . . .
Aaron: I study Mandarin when I have enough patience. I also enjoy camping and hiking, hot springs, biking, and digging for old vinyl with interesting covers or music or both. In the past I maintained a black and white darkroom. The Dirty Mind Alter Ego Pad, one of four new pads that reveal who’s really talking. 4. Which is your favorite Alter Ego Pad “personality” and why? Damon: Dirty Mind. It was the first [created], and on its way through the production process, held on to more of the wonk and fluke of hand-drawing than the rest did. Aaron: “From The Dirty Mind of . . . “—because it’s dirty! 5. This is a two-parter! 1. What’s the weirdest thing you’ve painted on? And 2. 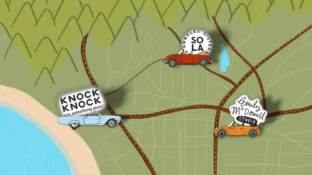 If you could paint a sign on anything—where would you paint and what would it say and/or look like? Damon: Drawing a blank on both of these. What’s Aaron saying? Oh, yeah: the Rickshaw Obscura—that was a pretty unique gig! As for number 2, man, I wish I were more ambitious about sign painting. Yeah, maybe if the question were of putting a sign on something . 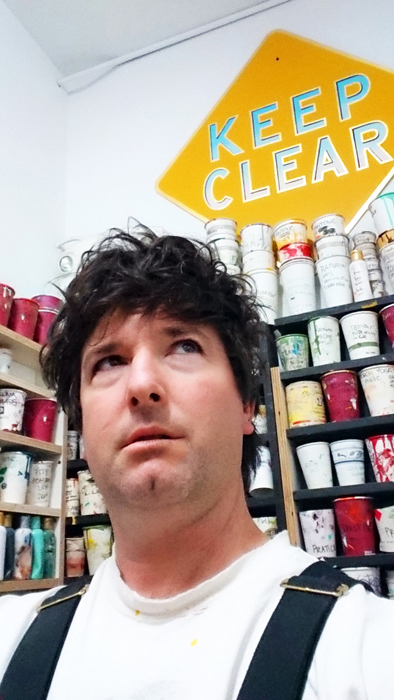 . . I’m not so sure my ultimate dreams of signage realization are specifically paint-related. I guess I’m thinking of someone like Jenny Holzer, who isn’t really glued to any particular medium to pass along her messages. 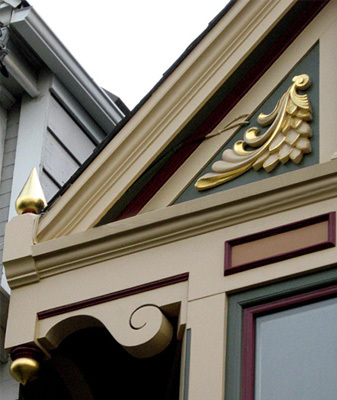 New Bohemia also does architectural gilding, like this! And I s’pose, since most of whatever ideas for “sign art” cross my mind, I tend toward some form of aphorism. I want their manifestation to somehow either comment on itself, and/or to help the words further along in their own quest for relevance. Like, why is it painted? Would it make better sense in bronze, or in lights? Or maybe, yes, of course it’s painted, because paint is how signs are done in this place; like, say, on the side of a hut on some monastery grounds in Bhutan, I might feel proud of having painted some sort of useful koan, perhaps, “What is the sound of one hand washing the other before returning to work?” Do you guess they paint signs in Bhutan? Anyway, I s’pose painting a restroom sign, even in Bhutan, doesn’t hold all that much allure for me . . . But I’d be happy to do it, especially if it extended my stay in Bhutan! Aaron: Not sure how “weird” it is, but painting the camera obscura bicycle was fun! I’d say skywriting is the ultimate typographic expression. 6. What are 3 things on your bucket list right now? Damon: Jeez . . . I dunno. Lotsa travel. Antarctica, Mongolia, Namibia. I guess that’s three. No, wait—that’s just one: visit these deserts. Let’s throw the Sahara and the Atacama in there, too. Then, number two is . . . visit these islands: Seychelles, Galapagos, and Cuba, not necessarily in that order. Then, ooh—number three, off the top of my head, megacities: Rio, Cairo, Mumbai . . . Oh, can’t forget Tokyo . . . Shanghai, Jakarta. Yeah, I guess my bucket list begins and ends with sorting out life such that I can just constantly be traveling. Aaron: A solar-powered graphic arts studio? Travel to Istanbul by train? Learn Cantonese? I don’t know, every day the bucket expands and contracts relative to what is going on in my life. 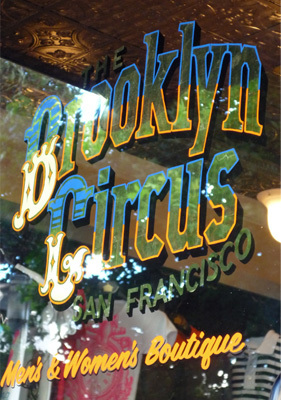 A hand-painted sign by New Bohemia. A New Bohemia design on a car. 7. If you could cook a meal for any fictional or real person, who would it be and what would you cook for him or her? Damon: Where are you getting these questions from?!? Is this one you pose to every creative partner? Guess I have to look at earlier entries in your blog here . . . Ergh, I have no faith that I’m going to come up with anything either as funny or poignant as whatever’s come before, and then, whatever crap I come up with, this questionnaire is sure to somehow, magically, perpetually, dreadfully, be the number one result of Googling me. New Bohemia’s work on glass. I asked a painter here how she’d answer, and she said, “It would have to be some sort of large ornate insect,” and although it turns out she was talking about what she would cook, I thought she meant that’s who she’d eat with. So, I’m going with that: Gregor Samsa. Now, granted, he seems to prefer to nosh on rotting food scraps and I’m sure I could probably gladly clean some things out from deep in the refrigerator. Nonetheless, I also think that he might enjoy something with truffles and/or Parmesan, since those flavors have a bit of the whiff of garbage to them! So, I’d prepare my renowned recipe for wild mushroom risotto, which I’ve cooked for people across the globe, and which adapts well to all manner of ingredient adjustments. At least then I’d have something delightful for myself and my wife, and whoever else is coming over to meet Gregor. And if he wants to eat trash instead, he’s welcome. But what would we talk about? I guess it’d be a fun challenge working out how to communicate! Something to mitigate the anomie for a bit, anyway. Aaron: I’m really more of a graphic artist than a cook. How about an ice(cream)-nine dessert social with Kurt Vonnegut? For more info on New Bohemia Signs, check out their website, and “Follow” them on Facebook, Twitter at @nbsigns, and Instagram at @nbsigns. All photos courtesy of New Bohemia Signs.